I know the cliché is don't judge a book by its cover, but I really think we ought to be more specific, because at least in case, it ought to be don't judge a book by its cover lines. Cover lines are those oh-so-tantalizing mini-reviews (often riddled with ellipses), and even though I know they're selected and edited to avoid any ambiguity about a book's greatness, I still fall for them from time to time. Certainly, some review sources carry more weight than others (I'm sucked in faster by the New York Times Book Review, for example, than I am by a publication I'm not familiar with), but still, I sometimes fall for the hype. This isn't to say that good cover lines are lies – often it's quite the opposite – but the they do sometimes unfairly set up a book to be something it's not, thereby building up my expectations and leaving me disappointed to find a book is not what I thought it was, when in fact it's still excellent. 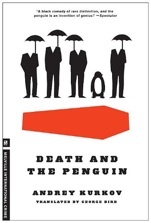 This was the case with Death and the Penguin by Andrey Kurkov (and translated by George Bird); the cover professed a "a tragicomic masterpiece" via The Daily Telegraph and I went in expecting laughs. What I got, though, was something much deeper and, to my mind, much more interesting. Death and the Penguin is set in Kiev during, at my best guess, the mid- to late-'90s. When it opens, Viktor Zolotaryov, an aspiring writer, has just finished a short story he intends to try and sell to a newspaper. When his first choice turns him down, he goes to the competition, who ask him to leave it behind for review. He isn't expecting much, so when he gets a call he's pretty thrilled. Only, the newspaper doesn't want the story; instead, the editor in chief calls him in for a meeting – he wants Viktor to write obituaries. But, he adds, they won't be your regular obits, they will be written while people are still alive, filled with details about their accomplishments and relationships – he calls them obelisks – and Viktor can decide where to start by picking "notables" out of the newspaper. For his trouble, he'll make $300 a month. Thrilled, Viktor returns home to his penguin. Yes. Viktor acquired Misha when the zoo started selling off animals it could no longer afford to feed. Viktor originally bought the king penguin because he thought having a pet penguin would cheer him up, but Misha is not too happy himself, so the two live a quiet and sort of sad life up until the point that Viktor gets this new job. Viktor's first obelisk is about the culture minister – still in great health – and the Chief is very pleased with it. Viktor ran around, did interviews, dug up information, and is quite pleased himself, although he finds it tedious to wait for the man to die before it can be published. As it turns out, though, he doesn't need to wait long. The Minister dies in the night and his paper is the only one to have an obituary on hand, and although it is published under a pseudonym at the Chief's recommendation, Viktor is thrilled to see his work in print. Soon, the Chief starts delivering files on the notables he would like Viktor to write about, and it's not long before these obelisks are also in print. Viktor is rather oblivious to what is going on, but when an acquaintance (a man for whom he has written several obelisks, for extra money) comes by and drops off his 4-year-old daughter for Viktor to look after, he starts to worry. Sonya loves Misha the penguin, so that works out, but Viktor is in no way prepared to look after a little girl, and when the Chief comes by and tells him to get out of town for New Year's, things start to look a little dicey. Then, in a "darkly comic" turn of events, Viktor is hired to bring Misha to the funerals of some of the men for whom he has written obelisks. A penguin, it seems, brings a touch of class. Things unspool from there. Reading Death and the Penguin reminded me of what I enjoy most about books written for a foreign audience and then translated, without preamble, for an audience elsewhere: namely, that you are plunked down into the reality of a place you probably know very little about. That sense of slight disorientation works especially well with Kurkov's writing, because Viktor himself seems to be somewhat unaware of his reality. He is remarkably passive about his own life, and mostly lets life pul him along; he doesn't have to work for a family because, after being given Sonya to care for, the young woman he hires to be her nanny soon fits herself into his bed (if not quite his affections) and there he is in a family. Acquiring Misha is one of the few active things he does, and so perhaps it isn't surprising that his affection for his penguin is much deeper than he realizes. Besides being a great, atmospheric, intrigue-filled novel, Death and the Penguin has an unexpected tenderness at its core. While it didn't make me laugh (and do feel led to believe that it would), Kurkov's story instead made me curious, which is better. I wanted to know what was going on behind the scenes, to figure out what Viktor was going to do, and how everything could possibly evolve. The novel is written in short chapters that bring everything to a head and then end, which makes for quick, suspense-filled reading. But perhaps the greatest aspect of Death and the Penguin is the one you can't experience until it is finished: that, as you've raced through Viktor's life, you've become steadily attached to Misha, the silent partner, and feel suddenly bereft when the penguin is no longer a daily presence in your life.